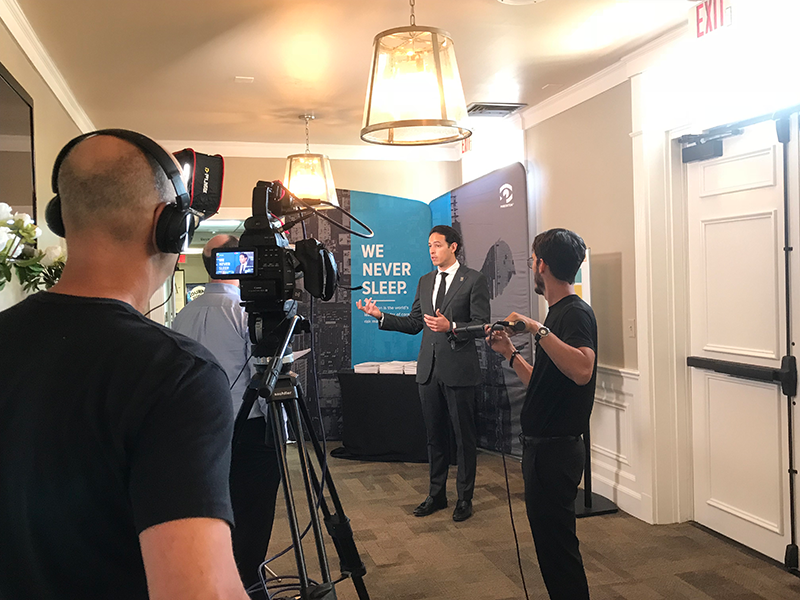 When you’re producing a conference or convention, it’s the perfect opportunity to create a promotional or highlights video to generate excitement for the next conference you’ll have. A well made convention promotional video can radically increase the number of attendees you register, but how do you get it done? How to hire a video production company – click here to see what you need to know. What activities your video should include. Why interviews or testimonials should be included if possible, and how to do them. How many cameras you really need. First, you’ll need to determine your maximum budget for your convention/ conference promo video. This may seem obvious, but it’s important to have at least a general idea at the start of the project. Your budget will determine what your promo video will be able to include. You’ll see what I mean below. Your video can be as frugal or as expensive as you wish. It’s like a commercial. You can create a bare bones 30-second commercial for next to nothing, or you can create a 30-second commercial that costs a million dollars. So to start, you’re going to want to have a maximum amount that you’ll need to stay under. Determine activities and events that should be shot and included in the video. You’ll need a good handle on all the activities and events happening in your conference, and you’ll want to decide which activities should be taped and included in the video. As you decide on what to include, you’ll be choosing things such as the number of video crews working simultaneously, the number of cameras, etc. This of course must work with your budget. If your budget allows, you’ll want to get the majority of activities, if not everything! However this is not always possible, so a good production company should be able to guide you to make the best use of your money. For some conventions/conferences, in order to get everything, you may need to add crews, equipment and even time. For example if you have activities from 7 am to 11 pm, you may be entering into overtime which can usually cost the normal fee plus an addition of another half or double the normal fee. Or perhaps you have two or more activities running concurrently so you’ll need more than one crew to cover both. Of course, the actual events along with your budget will determine what’s possible to shoot at your convention/conference. Also consider that emotions count too. Again, the more variety the better. A variety of emotions create a bigger impact in conference promotional videos. It’s helpful to show attendees having fun, listening with interest, laughing at a speaker’s joke, applauding, or being moved by information, etc. This would mean having a camera aimed at the audience. Determine if you want visuals only of speakers on stage, or you want their voices as well. Showing your speakers in your video can be great. You can show them speaking without sound, with background music. Another option is to add a brief but compelling sound bite from their presentation to the video. I find that this can be more effective than just showing the speaker with no sound bites. This might add something to the cost. For this you’d need a crew committed to obtaining the speaker’s video with a tie into the audio system of the room. Decide whether you want interviews and/or testimonials, and how you want them shot. Interviews can be one of the most effective tools for success in a convention/conference promotional video. There’s nothing more persuasive than having your target market’s peers rave about the experience. Also consider interviewing presenters, staff and management to increase effectiveness. If you do wish to hold interviews, you may wish to create an interview set. Often our clients will rent a meeting room where we can create a nice looking, branded set to place the interviewee’s in. This keeps background noise to a minimum. We have also used a portable green screen so we can add a background later on. As an alternative, you can choose man-on-the-street interviews held amidst the activities, or off to one side of the activities. Don’t embarrass anyone. Try to avoid shooting anything that your guests might be embarrassed about. For example, we tend to shoot meals only at the beginning, before everyone is eating. Footage of people chewing food is never pretty. We also shoot parties toward the beginning. We want to avoid taping people when they are drunk and acting out. Music sets the tone. A great song can set the mood in your video and your music should fit the tone and subject of the conference. When choosing music, be aware that you can choose a well known song, but that’s usually very expensive. Remember, it’s against the law to use a song without obtaining the rights, and if you do, you can be opening yourself up to an expensive lawsuit. Your video production company should know this and should help you avoid future legal issues. They can also be liable. Most of our clients choose music from a Royalty Free stock library, which is comparatively very inexpensive. Still, Royalty Free stock libraries vary in quality, so you’ll want final approval over any music that your production company chooses. Editing style also sets the tone. There are a lot of possible formats and styles that your show can be edited in. Your editor should keep the subject and tone of the convention/ conference in mind when putting the show together. Some subjects lend themselves to lively, upbeat editing, and some just don’t. A good editor tells a story and builds emotion. He/she should be working with the music, effects and editing to do just that, while keeping the viewers attention. Show your conventioneers the video! These videos can be put together as the conference/ convention is happening, and shown on the last day of the conference/ convention. This can help motivate them to come back! Plus we find that the convention attendees often love seeing themselves in these videos. They tend to get really excited. Size can matter to your budget at a convention. 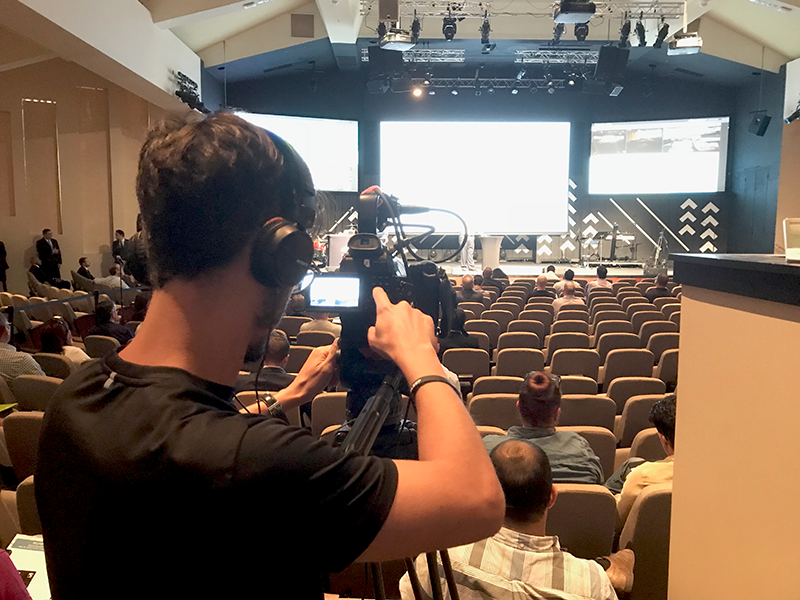 For example, keep in mind that the size of a convention hall and/or the size of your audience could determine the need for certain types of cameras. A larger audience may require a camera that can be placed in the rear of the ballroom. Do You Need a Video Production Company for your Conference or Convention? Check out what makes us your best choice of video production company for your convention or conference video. You may also want to check out our demo for convention, conference and trade show videos. If you need an experienced and professional team for your conference or convention videos, give us a call! We’d be happy to talk with you, give you a free quote and some ideas as well. There’s no obligation at all. © Copyright 2019 Ball Media Innovations, Inc. All rights reserved. Any reproduction of the written contents or images on this website without prior written consent by Ball Media Innovations, Inc. will be prosecuted. This site is protected by Copyscape. Miami Video Production article.